Salinas, a small beach/resort town in southwestern Ecuador, was never on our radar. Because we weren’t able to get a sooner last-minute flight to the Galapagos, we had 5 days to kill around Guayaquil, and a hankering for some beach time and fast Internet after Bolivia. After a bit of Googling “best beaches in Ecuador” (we do things like that a lot), we stumbled across Salinas. Upon further investigation, we found out Salinas was a kind of expat haven, especially for Americans and Canadians that wanted to stretch their retirement dollars and enjoy a relaxing beachfront atmosphere. We found a hostel online that promised to have the fastest Internet in Salena (which I needed to not pull my newly shortened hair out for work), and it delivered. It was also attached to a bar, which delivered cheap beers and tasty American food as well. The owner moved here from Kentucky about 5 years ago to open this bar and hostel, and enjoys making chili and cooking burgers. We were happy to oblige him and eat all of his offerings. 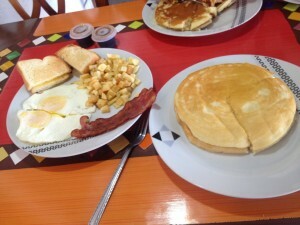 There was also a Canadian place that made pancakes, which we frequented every morning (it’d been a while, don’t judge!). Pancakes! Bacon! Eggs! Oh My! So we didn’t really do much in Salinas, other than the occasional trip to the beach. 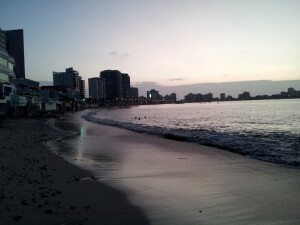 We enjoyed walking further down the malecon, where most of the families were staying. The city was funny, because at night most of the teens and twenty-somethings of the families would get dressed to the 9s and go out and party. It was quite a scene. There were some nice sunsets here as well (then again, almost all beach sunsets are beautiful). Would we make a special trip back here? No. Would we retire here? Probably not – there was a lot of gossip that gave it a “Real Housewives” vibe. But was it good for a few days to unwind, relax, stuff our bellies, and get some work done? Absolutely.